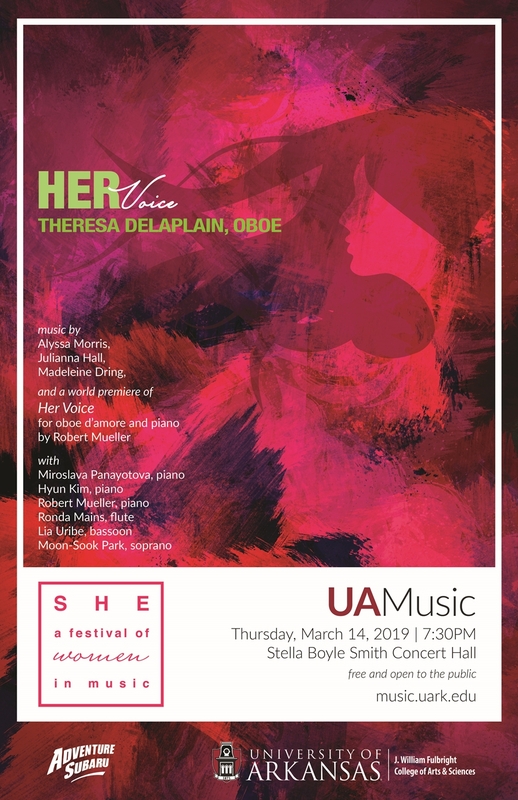 Theresa Delaplain, professor of oboe, will present a concert as part of the SHE Festival of Women in Music called "Her Voice." The collaborative concert will be at 7:30 p.m. March 14 in the Stella Boyle Smith Concert Hall. The event is free and open to the public. "Imagine the voice of a young mother telling her infant child "Everything is going to be all right," "Mother is here, you can go to sleep now." But the world is a confusing place and the child takes some convincing before finally drifting off to sleep. There may even be anxious moments where peace and quiet seem a world away, but the soothing voice of the mother keeps returning to comfort the child in a way that no other voice can. Perhaps many of us now feel the same confusion about the storms of life and we think of our own mothers, and long to hear 'Her Voice.'" Joining Delaplain for the concert are Miroslava Panayotova (piano), Hyun Kim (piano), Ronda Mains (flute), Moon-Sook Park (soprano), Lia Uribe (bassoon), and Robert Mueller (piano). In conjunction with Women's History Month, the Department of Music in the J. William Fulbright College of Arts and Sciences will host an inaugural, month-long festival throughout March highlighting the major role that women have played in the art of music. Mains said that in a time when society often strains to listen, "SHE makes room for audiences to hear new sounds, to feature composers of fame and lesser-known stature, and to amplify exceptional stories — all drawing attention to compositions by women, works inspired by women, and music for women."